I have never liked the color yellow very much. 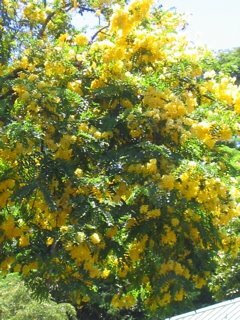 I avoid wearing it, have never painted a kitchen a bright yellow, and I’ve never deliberately planted yellow flowers. There is a fascinating article online about the meaning of yellow. I suppose I’ve always looked at the negative meanings rather than the positive ones. Lately, a lot of yellow seems to have started coming into my life. I thought about this week’s blog as I was driving down the road, and the yellow stripes in the middle of the road caught my eye. Of course, it’s eye-catching, which is why some road signs and markers are in bright yellow. I started looked at other bits of yellow in my life. 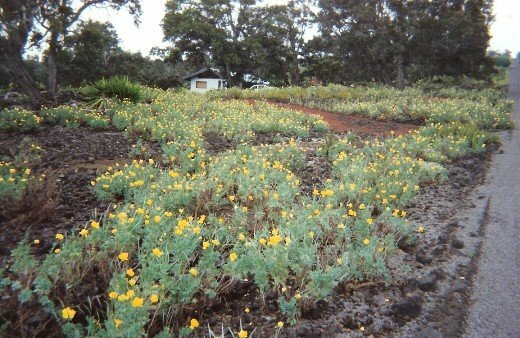 In fact, I have to admit that one of the reasons I was attracted to the home I have is the mass of yellow poppies in bloom around the acre. 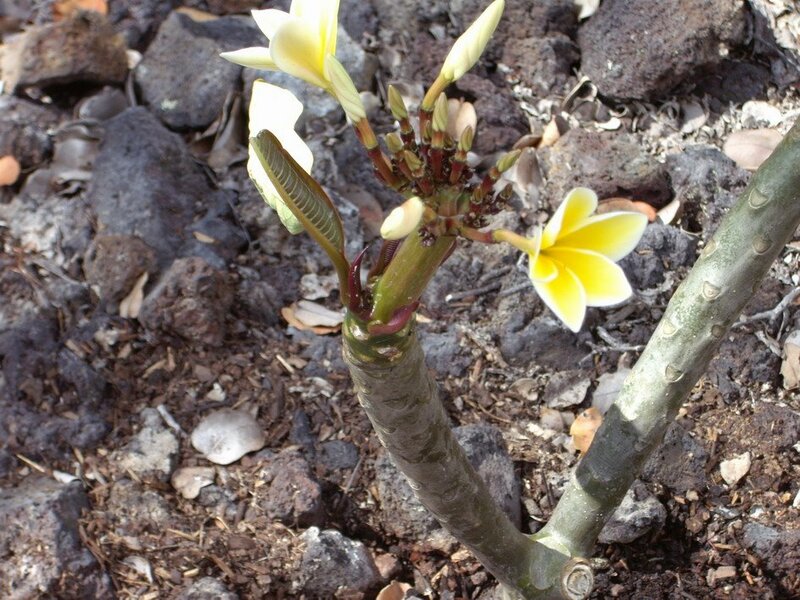 The first cuttings I put in were yellow plumeria. Some were brighter yellow than others. 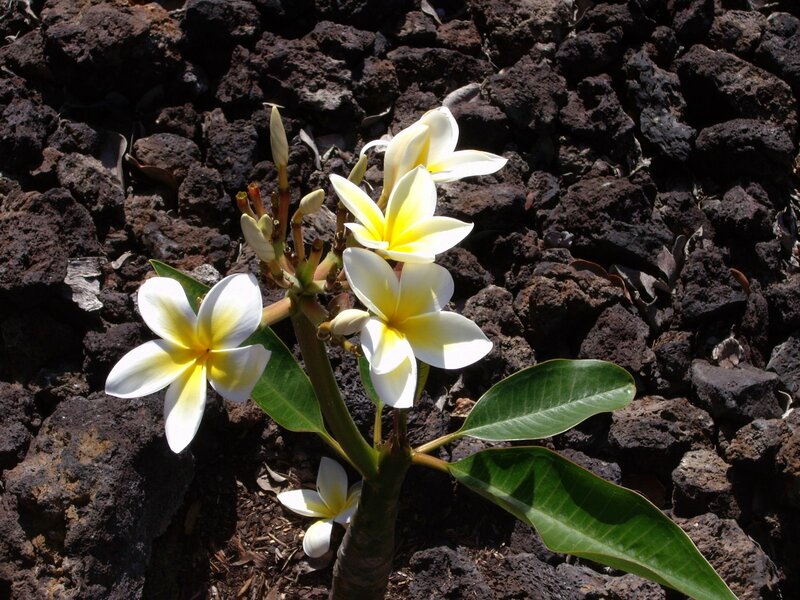 These are for the traditional plumeria leis used in hula dancing. Other of my plumeria had a delicate hint of yellow in the center. 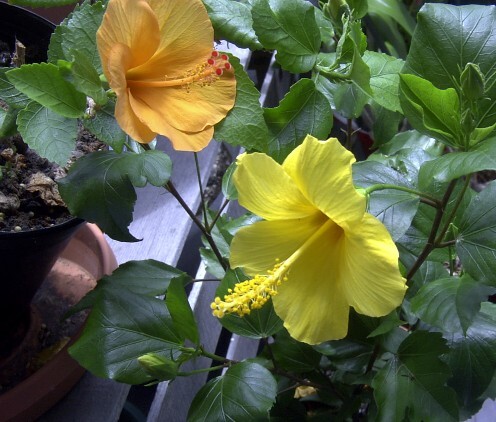 The state flower of Hawai’i is the yellow hibiscus or maʻo hau hele. 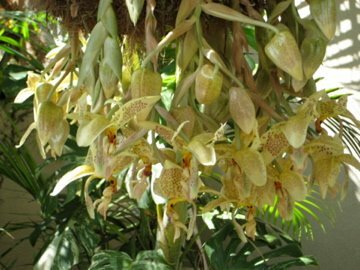 A friend has this pale yellow orchid growing in his back yard. It is one of the few fragrant orchid plants. 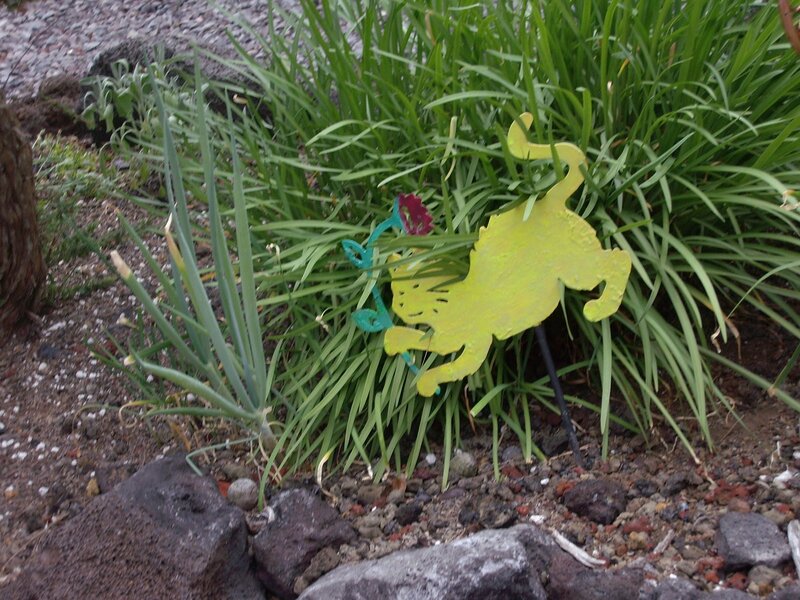 Carole and Heather Baker even have a frolicking yellow cat in their garden. 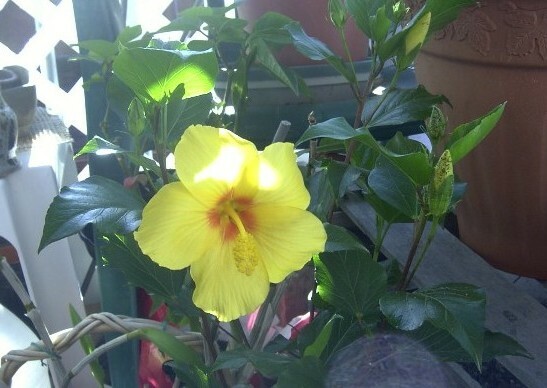 My daughter, Inga, has included yellow plants in her small garden. She writes that Boise has already had their first snow and she is busy getting her yard ready for winter. 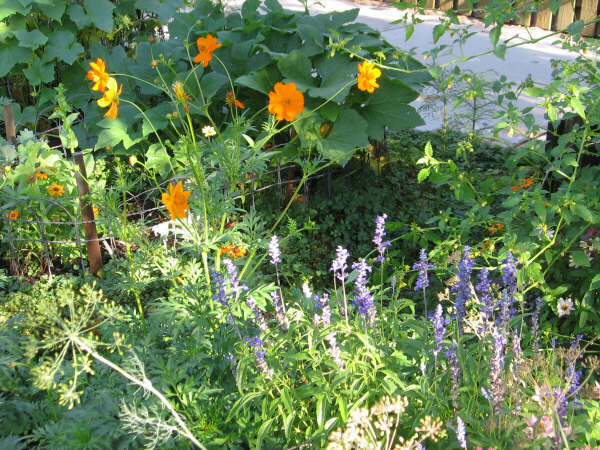 These beautiful flowers are temporarily gone. The opening picture shows her autumn arrangement that certainly includes yellow! Apparently, she’s not as afraid of yellow as her mother. 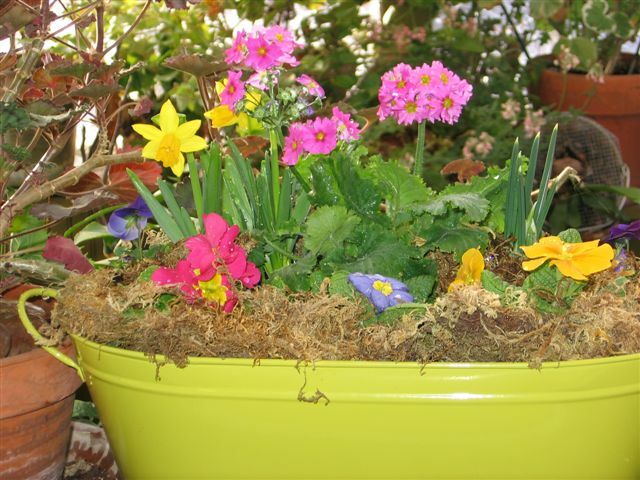 I love this painted container! I began to look at all the other yellow items in my life. 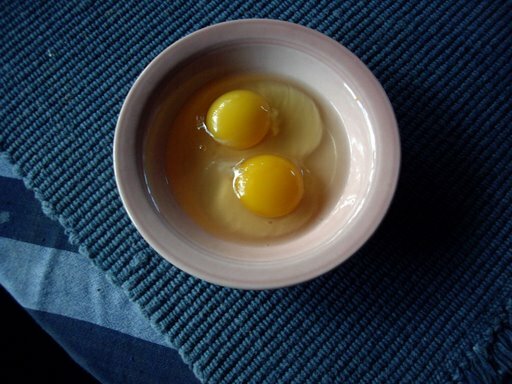 My “girls” give me beautiful yellow yolks in their eggs. 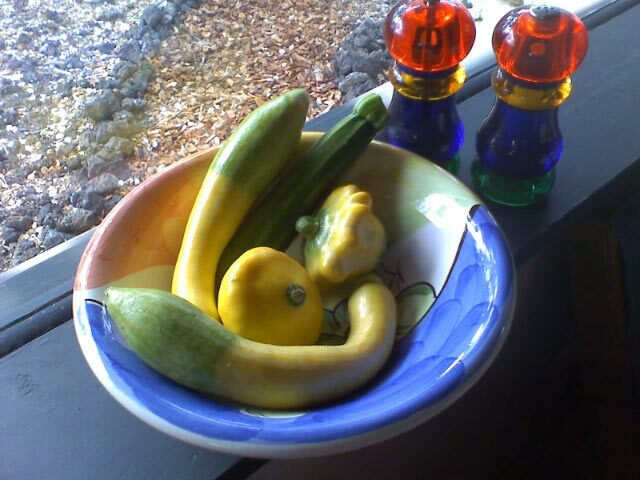 And garden vegetables that I love are often yellow. 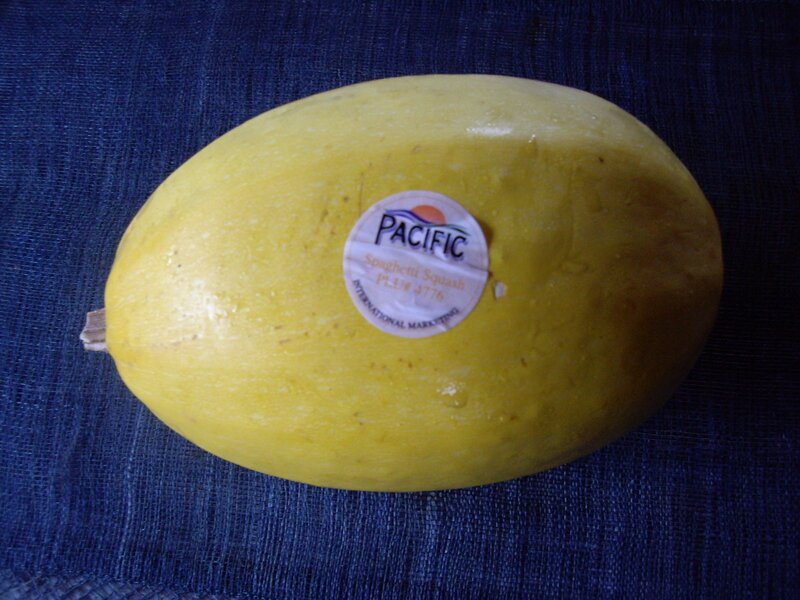 I didn’t grow this one, but I love eating spaghetti squash. 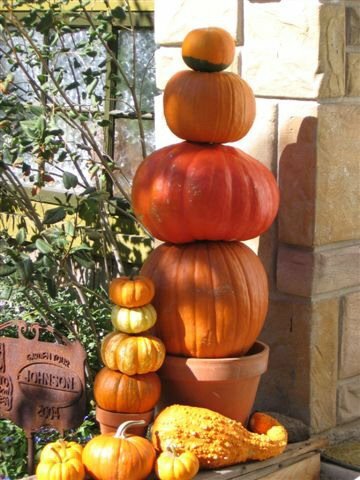 I may try to plant one someday. 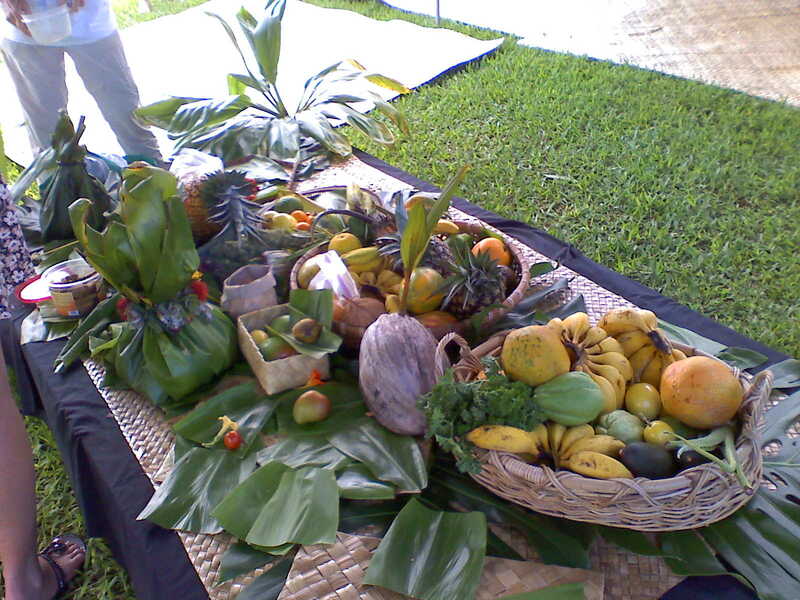 When I went to the Seed Exchange in June, the offering of fruits, flowers, and vegetables included many yellow items. 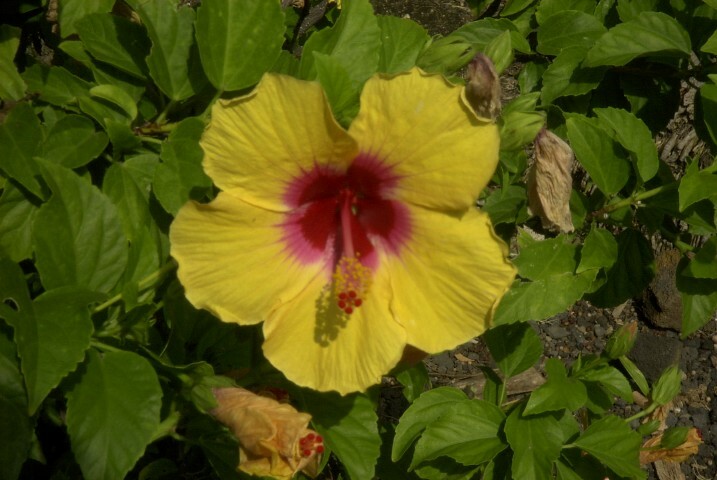 This incredibly beautiful yellow hibiscus with a purple center caught my eye when walking down Ali`i Drive one morning. 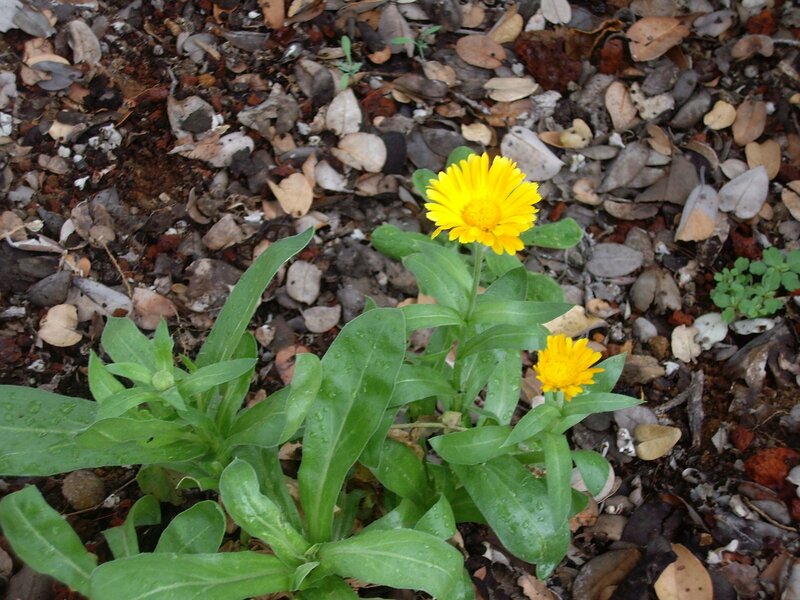 In my garden now I have this lovely yellow calendula (Calendula officianalis). Not only is it very pretty in my patio area, but the dried petals can add a rich saffron-like color to my food. I read that it isn’t especially flavorful, but can be sprinkled over a salad, chicken or fish to add that little spot of color. One last beauty in Kihei on Maui, near Yee’s Mango Orchard. One of the major events here in Hawai`i is the sunset. People pull over to the side of the road in their cars, or sit along the top of stone walls to watch, hoping to see the “green flash.” I saw it many times as I did my own watching from my deck on Ali’i Drive. 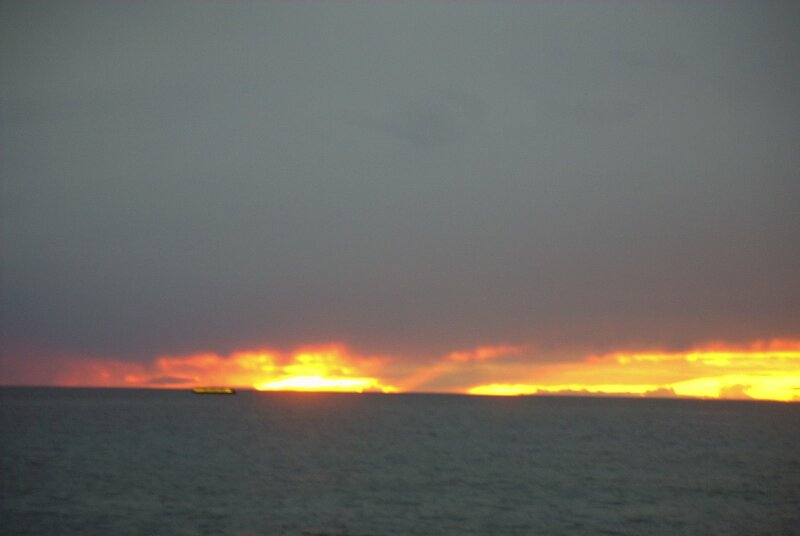 This picture doesn’t show the green flash, but it does give another view of yellow! If you look closely, you’ll see Captain Bean’s Dinner Cruise going by. I’ve been told that it no longer runs. It looks like I’m not as opposed to yellow as I first thought. But I still don’t plan on wearing much of it! I’ll enjoy it in the natural world.